From left, biodynamic gardeners Jim Oehler, L.A. Rotheraine, standing on ladder, Jeff Van Scooter and Brandi Buck stand in front of a 10 foot tall cherry tomato plant on Wednesday afternoon at the Evergreen Elm garden on Elm Street. Rotheraine claims it is the strongest tomato plant on the Planet Earth. “With all the billions of dollars that the genetic engineering seed companies spend, they cannot come close to producing the unique seed that Evergreen Elm makes to create this plant,” Rotheraine said. Evergreen Elm Executive Director Garry Pugrant said the agency has seeds available from the giant tomato plant. Donations would be accepted. The Selke Biodynamic Cherry Tomato grown indoors: The seed and plant of this unusual species contains forces that Emil Bock, in his book, The Three Years, calls "the cosmic sphere of sunlit clouds, air and wind..."
special seeds that produces these giants. This interview originally appeared in "Applied Biodynamics", the newsletter of the Josephine Porter Institute, Issue No. 51, Winter 2005-2006. Reprinted by permission. How in the world does that plant get so tall? Where did the Selke Biodynamic Cherry Tomato come from? These and other questions are answered by L.A. Rotheraine who gardens local and thinks global when it comes to biodynamics. First, a little history. In the fall of 1988, L.A. Rotheraine found a volunteer tomato plant growing in an old compost hill behind his home in Lewis Run, Pennsylvania. He transported the plant in a bucket of compost to the Bradford Central Christian (Catholic) High School where he was teaching history at the time. There, he grew it in a classroom with the assistance of the students. Seed was harvested from that plant, and two students started the seedlings inside the classroom that spring. 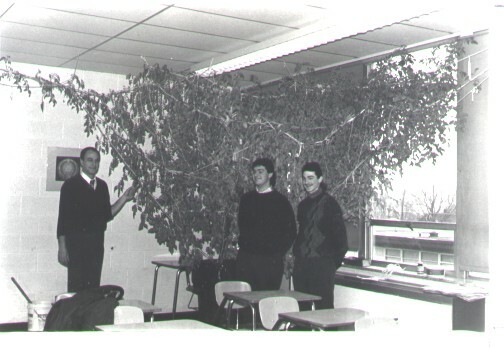 L.A. continued the tomato growing exercise indoors as a classroom project for two more seasons in the fall of 1989 and 1990. The strain became the giant cherry tomato plant. L.A. named the cherry tomato after Margrit Selke, who gave much encouragement and advice to him over the years. Margrit, who worked with biodynamic researcher Dr. Ehrenfried Pfeiffer, was also the maker, since the early 1960s of the Pfeiffer BD Compost Starter and Field Spray 1. She gave L.A. many large bags of siftings, leftovers not going into the finished Compost Starter. She also gave him very generous quantities of Compost Starter over the years. Some units were considered of lower grade quality, not for retail sale. 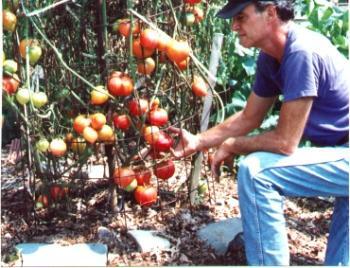 In the classroom, L.A. fed the tomato plant with the Compost Starter diluted with water as well as the siftings, which were also diluted with water. In the three fall seasons growing indoors, the plants were about eight feet high and seventeen feet long and produced 250 to 300 tomatoes indoors. Their growth was suppressed by the height of the ceiling. The Selke BD Cherry Tomato is now about twenty generations old seventeen generations grown outdoors, plus three grown indoors. L.A. feels this volunteer tomato plant growing in the old compost hill from seventeen years ago was a gift to humanity from the spiritual world. Patricia Smith: How did you get started in biodynamic gardening? L.A. Rotheraine: In the mid-1970s, I heard about biodynamic agriculture, and so began the path. I started using the planting calendar [Stella Natural in the late 1970s and started to use the Pfeiffer BD Compost Starter in the early 1980s. In fact, I've been saving the same seed of butternut squash that was watered in with the Compost Starter for almost 30 years. PS: What preparations do you use? LA: I've used all the preparations in great quantities over the years. I'm going to try to use only the [Pfeiffer BD] Field Spray this year to prove that's all you need to get started. PS: Which preps did you use before? LA: Everything, including the BD Compost Starter and Thun [a.ka. Biodynamic Compound Preparation, or BC] since the late 1980s. PS: Do you make your own biodynamic preparations? LA: Just the horn silica (BD #501). PS: Why did you switch to the Field Spray recently? LA: I switched to the Field Spray to try and find an easy way for Americans to be introduced to biodynamic agriculture. I started using the Field Spray in 2002. In the late 1980s, Margrit Selke was asking me to use it because it was an easy way to go. Instead, I used all the preps and the Compost Starter. If only I had listened to her. We had the solution in the Field Spray to start Americans on a biodynamic path. I now use the Field Spray both as a foliar and soil spray. At the Elm Street Biodynamic Garden, (during a growing season) I spray the tomatoes up to twenty times. The other fruit crops about a dozen times, and the root crops are sprayed about four to six times with the Field Spray. The five compost piles are still inoculated with the compost preps (BD #502-507). PS: With such a cold climate in Bradford, Pennsylvania, colder than Buffalo, New York, when do you plant tomatoes? 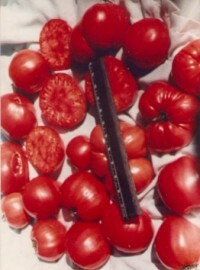 LA: In our last growing season, our seeds for the first tomatoes were sown indoors February 22 . And I started transplanting them outside around the 19th of March, and by Easter Sunday [March 27] we had our first thirty plants in ten of the Cherries [Selke BD], ten Elm Street Early [formerly named Pearplum], and ten RC Ratatouille. By the middle of May, the rest of our tomatoes were planted, about 75 total. Most gardeners in the area do not transplant tomatoes until the end of May, and many gardeners do not transplant until June 10. Our tomatoes are protected with thick plastic igloos [recycled clear food containers] and blankets. I'm not afraid to keep them covered for three days with snowfall. They've been in when there was a foot of snow on the ground, and survived. This year I will start sowing the tomato seeds indoors March 3. The first plants will go in the ground by April 8. And by Easter Sunday (April 16) we will have thirty tomato plants in the ground. If the frost hits, or it's extremely cold, I'll spray with 507 (valerian) twice in the morning and twice in the evening. In Bradford, the last frost can be as late as June 30, and the first frost can be as early as the third week in August. This is why, in the past I have gone through up to 30 units of valerian in a growing season. Some summers I've used as few as 12 units. This year, if I have the courage, instead of spraying 507 in the extreme cold, I'm just going to use the Field Spray. PS: Are there other challenges besides the cold that you have to deal with? LA: At the Elm Street garden we miss the first two hours of morning sun in our best spot. Most of the garden is without sunshine until 9:00 A.M. because of a hill on the eastern side of the garden. One part of the garden doesn't get sun until 11:30 A.M. This is why I've used large quantities of the preparations, especially 501 and 507, or a combination, to compensate for the lack of sunshine. I didn't spray with 501 last year, didn't need to, and the Field Spray did the job. 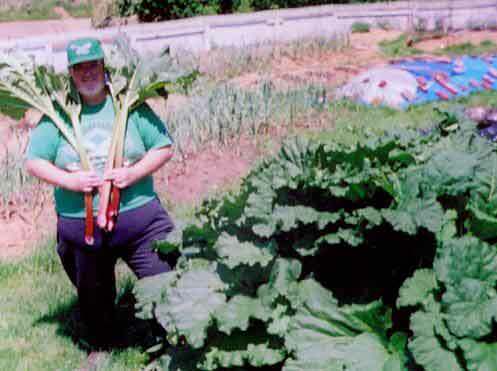 Another major challenge over the years is the green cabbage and orange beet thief. This pestiferous human only steals green cabbages and orange beets! But, he leaves the outer leaves of the cabbage and the beet greens for us to compost. We have been trying to catch him for over a decade and we have failed. This guy has driven us nuts. It looks like we're going to put a video camera in just for him. 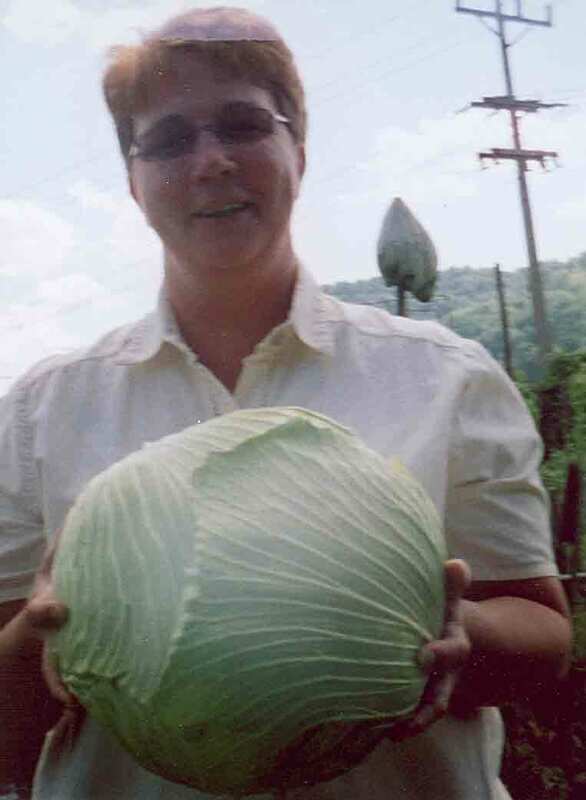 Evergreen Elm's Melissa McGuire with a green cabbage. If this guy would just come in and ask us, we would give him a few cabbages and some beets. And two more problems, the slugs (which are picked off the plants) and the wind shear is terrible. There is no protection from the strong winds. PS: Why don't you plant a windbreak for the garden? LA: The garden is on the side of a hill and because of the slope and swirling winds, it would not work. PS: Now getting back to the prep applications, have you lost plants from too much spraying of the 501? LA: Over the course of one summer in the 1990s, because of cold, damp days, I sprayed 501 about a dozen times, sometimes three sprayings in the morning. [Hugh] Courtney said, There can be an imbalance if too much 501 is used, so you must be careful.2 It was a cold summer in 1994. Our big Selke [BD Cherry tomato] got sprayed four times with 501 in one morning. It looked like it was hit with a blow torch. It burnt out a portion of the tomato plant, but it didn't kill it. It shriveled the leaves up. It burned some cucumber plants too. I have no choice. I am in Antarctica here. I don't have anything to lose. I have to succeed to keep the biodynamic program going. Mike Rowley with biodynamic rhubarb at Elm Street garden. PS: On another occasion, I understand from Hugh that you had to rescue a tomato plant that was looking defoliated from the cold because the Philadelphia Inquirer needed a photo. What happened then? LA: It was the beginning of September in the early 1990s. The foliage was starting to die because of the cold. The Philadelphia Inquirer wanted a picture of the Selke BD Cherry tomato plant. So I called [Hugh] Courtney and explained the situation and he recommended watering the hill of the plant with 504 [stinging nettle] and 505 [oak bark] to bring the green growth back, and that's exactly what happened. PS: What was the turn around time? How long did you have to water the tomato hill to grow foliage back for the picture? LA: I think I watered for three to five consecutive days with the 504 and 505, stirring them in separate pails and watering them in at the same time. In ten days to two weeks, it brought the new green growth through out the plant, making it more photogenic, where before, the leaves were dying off. There was never a problem with the tomato production. It was just that the leaves were turning yellow and falling off because of the cold at that time of year. 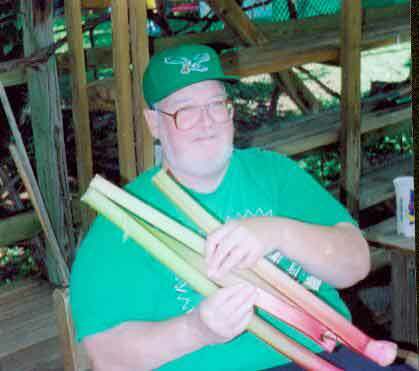 Mike Rowley with same biodynamic rhubarb after it has been dressed. We've got to get our people experimenting with the different preparations. PS: Yes, we all do, that's for sure. Now you have a unique way of saving the tomato seed that I believe our readers would be interested in learning. Did you develop this method to ferment the tomato seeds with the valerian? LA: I must have read about using valerian for tomato seeds, but it was my own idea to ferment the seeds in 507. I believe I was guided, as is the possibility for all biodynamic farmers and gardeners, from the spiritual world. So, it was my own idea, but it wasn't. I would recommend to everyone to use this fermentation process for tomato seeds, and cucumber seeds too. PS: What do you think makes the Selke BD Cherry tomato so tall and produce so much fruit with yields of 2,000 tomatoes on one plant? If modern people had not lost their relationship with spiritual things to such an extent, these grave times would not have come upon us. Only a very few today have insight into this connection, although it will certainly be recognized in the future. People think nowadays that when human beings pass through the gate of death, their activ ity ceases as far as the physical world is concerned. But indeed it is not so! There is a living and perpetual exchange between the so-called dead and the so-called living. Those who have passed through the gate of death have not ceased to be present; it is only that our eyes have ceased to see them. They are there in very truth. LA: The archetypal group soul of the tomato species, the angelic being that created the plant, gave us the plant to re-unite the physical world with the spiritual world. Its spectacular size and enormous yields give me the ability to explain biodynamic agriculture from its spiritual reality as an anthroposophist. It startles cynics and gives them a picture of what the anthroposophical world view can do for this world. PS: Now about your public presentations on biodynamics, you speak to quite a number of groups. Who are some of these that you have addressed? LA: I've spoken to dozens of different groups over the last twenty years. Everything from a fourth grade science class to the senior agricultural think-tank class at Penn State. PS: Do you encourage other BD practitioners to get out and speak to different groups who want to know about biodynamics? LA: Yes very much so. We must! Rudolf Steiner expected much of the world to be inoculated with the preps by this time. [Rudolf] Steiner said, the biodynamic compost preparations should be made available as quickly as possible to the largest possible areas of the entire earth, for the earth's healing. If Steiner were here, he would be disappointed. I'm an anthroposophist. I am disappointed that a lot of American anthroposophists have not seen how quickly we can prove the validity of our science on the world stage through biodynamics. I don't care if they're in Manhattan or Philadelphia, they could grow an exceptional Selke BD Cherry tomato in a five-gallon bucket, if need be. This would arouse their neighbors curiosity, at which point in time they have a perfect opening to introduce anthroposophy through biodynamics. When people see these plants, they ask the right questions for anthroposophists to answer. PS: Any groups you've spoken to recently? LA: I gave a talk in December  at the University of Pittsburg (Pitt), Bradford branch. There were local politicians, state representatives, extension agents and the assistant secretary of agriculture for the state of Pennsylvania. I spoke about BD Agriculture and the Elm Street Biodynamic Garden. There was a snowstorm that day. I didn't think they would show up, but they did. The assistant secretary of agriculture drove 125 miles from Penn State. She showed up. The local representatives wanted to show what McKean County can produce. PS: Your talk, was it well received? LA: Yes it was well received indeed. They were very enthusiastic. PS: Are the groups that you speak to pretty receptive to biodynamic gardening? Do they understand when you speak about the connection between biodynamics and the spiritual world? LA: About five or six years ago, I was invited to lecture to a stroke survivors group who wanted to hear about BD tomatoes and preps. I looked out at the audience and saw these stroke survivors, some who looked as if they may not be in physical bodies next year. So it was important for me to change from speaking about gardening, and instead to highlight the spiritual aspects of biodynamics the spiritual world could not enter the garden as intensely as it does without the biodynamic preparations, the spiritual science, the meditation. We couldn't grow the super veggies without this spiritual atmosphere. I told them death doesn't exist for humans, and our preparations are used to bring the spiritual world into the material world. If death existed for humans, it would not work. A woman in the group interrupted me and said, You don't have to tell us that. Most of us in this room have experienced being there on the other side. I get chills now recalling that. PS: I got chills when you were telling me about this. When people call about the Selke BD Cherry tomato, do you tell them about biodynamics too? LA: If someone calls on the phone and if they are interested in biodynamics, I tell them to use the BD Field Spray as a soil and foliar spray. I don't tell them about biodynamics if they are not interested. They are going to get excellent resuits with the tomatoes, let them take the next step. If they want to learn about biodynamics, then I will tell them about the Field Spray. PS: What suggestions do you have for gardeners at this time of year? LA: The spiritual world will let you know what to do for the garden if you meditate on it. This comes to you in a much more concrete way at this time [winter] . Meditation in the winter time is important. Get as much done in the fall and winter as you can, because the earth is more inwardly alive than at any other time. And always look to the heavens. PS: Thank you for this interview. Do you have a final word of advice for people? LA: Don't be afraid to experiment with the BD preps. Common sense should tell everyone that all of the preparations have very special powers, or Rudolf Steiner wouldn't have chosen them. Each is aligned to a spiritual being that acts as a group soul for each species of plant. We haven't scratched the surface with them. To me, it is wasting their spiritual potential and their health giving potential if we don't expand their use. We must be more creative with them. Don't be afraid to examine the spiritual aspects of biodynamic agriculture. 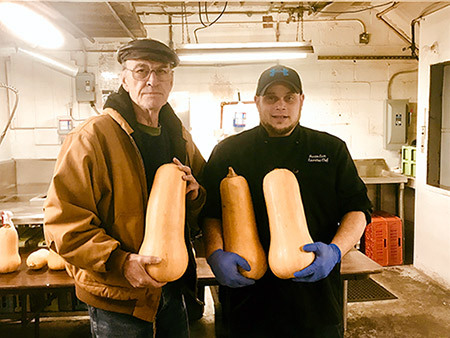 Chef at the Penn Hills Club, show Biodynamic Butternut Squash. Now that's an Organic Tomato Plant! 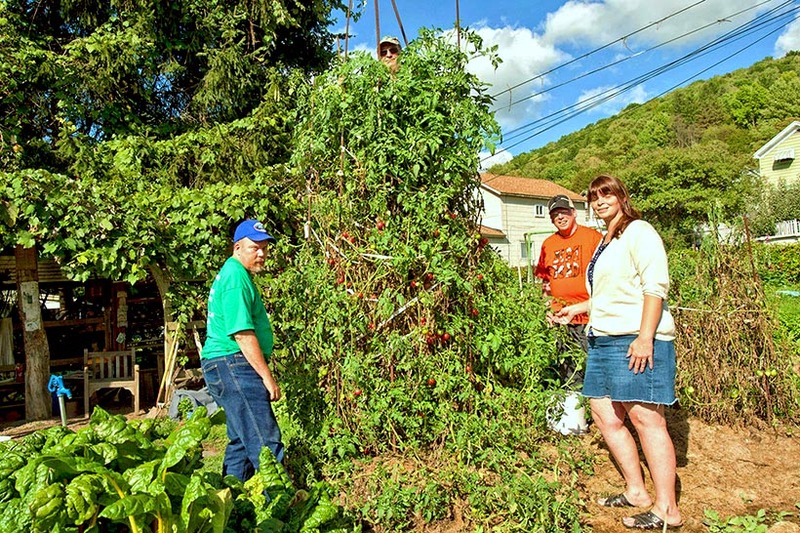 L.A. Rotheraine (at top of plant), Randy Johnson (middle) and Brandi Buck (right) supervisor, look over the 10 1/2 foot organic, cherry tomato plant. 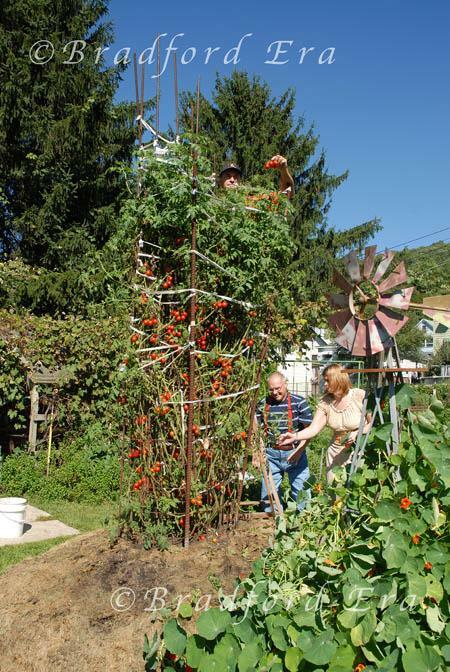 If there is no frost in the near future, the plant could reach 12 to 13 feet tall with over 2,000 tomatoes on it. The plant was grown at Evergreen Elm's garden on Elm Street and is an open pollinated Selke Organic Biodynamic Cherry Tomato Plant. Evergreen Elm has the only seed strain in the world for this species of plant. The plant was cared for by Evergreen Elm's gardeners, particularly Robert Tubbs, who was in charge of all the Selke Biodynamic Cherry Tomato plants. In the 1950's, Margrit Selke (1900-2004) began working with Dr. Ehrenfried Pfeiffer (1899-1961). She was making and selling the Pfeiffer products until she was 97. JPI was granted the licensing agreement from the Pfeiffer Foundation and General Compost Corporation for the production ofthe Pfeiffer BD Compost Starter and BD Field Spray Concentrate on August 22, 1995. According to Hugh J. Courtney, Very few biodynamic practitioners use BD #501 as extensively as L.A. Rotheraine. Indeed it is very much under utilized in this country. Rudolf Steiner, Staying Connected How to Continue Your Relationships with Those Who Have Died. Ed. and intro by C. Bamford. (Hudson, NY: Anthroposophic Press, 1999), 160.
for our Free Seed Offer.